I've always been a sucker for anything chocolate. Bad thing is: whenever I try to do something chocolatey, more often than not, I fail! So I've surrendered and have NEVER tried to make anything chocolatey for a long time now. UNTIL, kak Ana gave us a few of her recipes that most of know I've been trying. Still, I didn't even glance at the chocolate ones as I knew it'd be a disaster but once again, insomnia struck! Not knowing what to do, I first wanted to try out this biscuit recipe I found but remembered my rolling pin was still with kak Yun so I decided to flip through my recipe books. But a 'greater calling' was in order hahah..
To face my fear of making anything chocolate! So I decided to make kak Ana's chocolate cupcakes!! Actually, its a bit leceh to make your own chocolate paste first, then cool it, then only whip up the 'concoction' for it. Took a lil' bit of time la jugak and I ended up with a whole bowl of cake mixture.. alamak! Klau tak jadi, abis la sy.. sape nak ngabiskan?!!? So I finally put the whole tray (1st tray, mind you!) in the oven and waited..
..and when it was finally ready, I waited for it to cool first before I tried a bite! And yes!!! First time in a very long time, something chocolatey I made was kire jadi lah hahaha.. yeayyy! 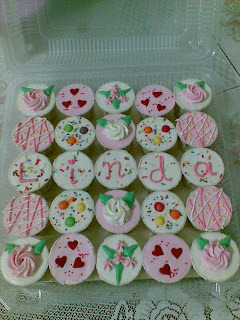 Btw, this is one I did for kak Shima who wanted to suprise her sis. A bit over the top kan.. haisshhh, camne la nak blajo decorate² nih! Me and Arep had planned to go to the Bandar Baharu Ramadhan Bazaar today to sample this years version of Nasi Ganja (now known as Nasi Anja) but it was raining cats and dogs all throughout the afternoon. 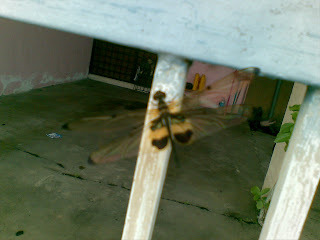 When I arrived home, I was opening the gate when I heard someone express the Salam. I turned around to find one of the surau elders smiling while handing me a packet of bubur lambuk.. waaaahhhhh! 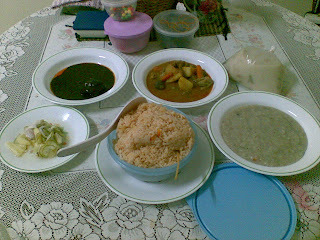 Campur ngan bubur lambuk from the moreh, kenduri bubur lambuk la sy hehe.. I was on the rush to go to school this morning and whilst I was trying to shut the gate, something whizzed passed me. It was yellow and black and all at once I tried avoiding it as I only thought of the stinging bee and how it had hurt 24 '10' years ago. During noon, I headed back home for a nap and a pleasant sight greeted me. Once again I saw a flash of yellow and black but I realized it wasn't a bee. This was what I saw..
Neat huh.. okay la, my phone's camera doesn't exactly take good pictures so I took another one that afternoon when once again I was greeted by this 'being' when coming home from school to get ready for iftar. 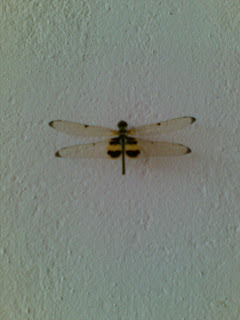 I'm not sure about you guys, but this is the first time I saw this type of insect. I'm sure if I Google, I'd find the exact name of it but for now, let me just call it "The product of a bee and dragonfly gone elope!" Bersempenekan Ramadhan yang bakal menjelme lagi berape jam saje lagi, sy telah diberikan sesuatu oleh kak Maria. Ape ye? 2. Mase di Almashoor, kami diajar berzikir selepas solat dgn satu 'irama' ini yg menjadikan kami tak perlu 'mengire' tasbih, tahmid dan takbir kerana 'irama' itu elok² je seswai..
3. Tasbih ni cantik.. klau sy riak, how? 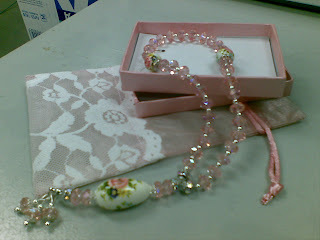 But thanx to kak Maria. InsyaAllah sy akan belajar menggunekan tasbih ini demi kak Maria yg nak hadiahkan bende cantik yg bergune. Takkan sy jadikan ia gajah putih sahaje.. tp seyes! Sgt cantikkkkkkkkkkkkk..
..and jugak untuk saudara² Muslimin dan Muslimat sy: Ampun dan maaf dipinta di ambang Ramadhan AlMubarak ini. Moga kite semua diberi taufik dan hidayah untuk menjadi hamba yang lebih diredhai, anak² yang lebih soleh dan solehah dan insan yang lebih baik! I think due to the excitement of kak Ana's class and since I've already had my own oven since the end of last year, once again I experimented haha..
Actually, the first one ni was lefovers from the cupcakes I did for Imran (Uwaaaa.. masih kecewe!) 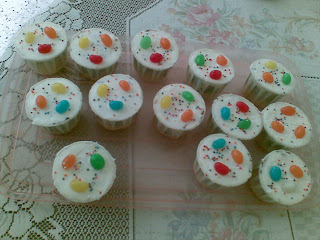 so since buttercream pun ade leftover, I simply spread it on the cupcakes and put some jellybeans on them. Alaaaa, I wanted to give them to my form 1 students kan, kire aci laaaa.. nmpk ala² budak kaaan hehe..
Then since I haven't experimented on the chocolate ganache (and since the bahan² telah pun bermestautin di dapurku since last week hehe..), I decided to make them. The guinea pigs this time? My form 2 class hahah.. 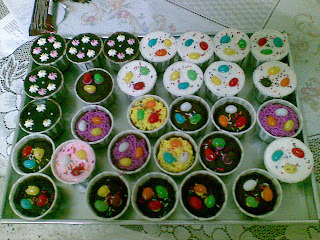 I planned to just cover the cupcakes with the chocolate but it seemed too plain bile siap. Budak² kan, nnt ade je comments nye. 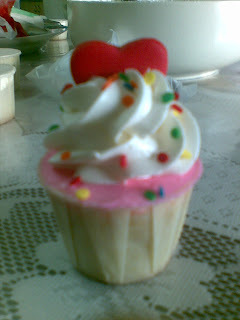 So I whipped up another batch of buttercream (since nak buat one for our HiTEGians yg konvo gak kan!) and took a leaf outta kak Wan's book and proceeded to do simple writings on them. Since ni my form 2 class, I tried my best to put down the Maths formulae for the form 2 syllabus..
..nmpk tak the 'letak pen' one? Hahah.. thats my favaourite phrase in class everytime I wanna explain something and the studetns keep wanting to write it down WHILE I'm talking! My student Imran (lagi? Uwaaaa.. masih kecewekan name Imran!) took that one haha.. dia kate, "Sbb cikgu suke sebut, sy nak!" 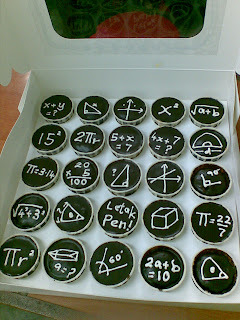 The other one plak, ngan memandai nye student sy berkate, "Cikgu, sy nak yg formula circle tu.. sbb pas makan ni mesti sy terre circle, kan cikgu?" Then mlm plak I did the one for the HiTEG newbies (Nor, Afzan, Wany, Firah and Jihah). Jugak tanpe nilai estetik, okay! Setelah sekian lame berkenankan name Imran, out of the blue Abah and Umi decided to name their new son IMRAN!! But now, I have to 'let go' of that name.. I REALLY need to get away from you.. Guess what made me smile lebar today? Today I had my usual class in Jawi. Had a blast from the past jap when someone called me during class. It was makcik..
Actually, agak la jugak rase bersalah with her coz I haven't returned her last calls and jugak sendiri pun dah lame tak call her. Not that I don't like her tau! I love her! But its just that now it feels like I wanna avoid things that remind me of IM. I'm over him, seriously! But with my current 'serabutness', I don't really wanna think about him even a bit or I'm gonna blame him on my 'serabutness' too haha..
Yeah.. I know! Get over it, dah nak masuk tahun ke7 dah ni!! Haha.. I had ordered some choc cupcakes for them from kak Wan tp sgt la terlambat bg kan. Had planned to give them before their trial but kept postponing sampai la diorg dah abis pun trial.. cian korg kan! Then, while getting ready for my class, got a text from Hasz asking me if I was home this afternoon. Told her tak bley janji since I had class sampai malam kan but when she insisted on knowing when I ws free, I ask la kenape. 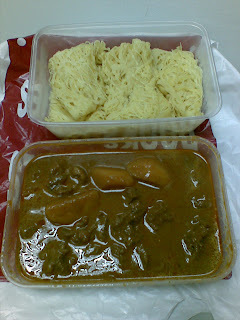 Turned out she had made some spaghetti and wanted to send to me.. yeay! Tak yah carik dinner tonight. Didn’t take any pictures though since I was VERY hungry! Had planned to eat only half and the other half after class but too lapar laaaa.. only when I cleaned up my plate did I think of taking a picture of it haha.. dah selamat dlm perut Ayu! Then during the night class, was busy texting Izati and Irfan on perbincangan name adik baru ku itu. I’m trying to NOT let Abah and Umi take the name ‘Imran’ since I already chup that name for MY son (very gatal kan!) so was getting suggestions from them. Then my form 2 class itu sgt la kepoh and diorg pun sibuk gak bg name hehe.. yang mane had names starting with ‘I’ pun promote la name diorg kannn haha..
Pastu when my phone berbunyi, was expecting text from Izati or Irfan with yet another suggestion but turned out it was from Shahril. He asked me if I had a class (which dia tau mmg ade!) and sy dah tersenyum coz this usually was a cue to I-have-something-for-you yang klau from Shahril, bermaksud makanan hehehehehehe..
Yeay! Menjerit sy ngan seronoknye sampai someone in the house tu pandang keluar hahah.. malu okay! He didn’t tell me what it was and I was expecting some kuih or something sbb dia ngan mak dia cam rajin wat bende manis. But I was curious so I checked the container in front of him after he handed the plastic bag to me.. dan sungguh la rase cam bbudak when I saw what it was. Melompat² like Annisa bile tak sabo nak bukak present birthday dia hahah..
Trus je nak balik rumah and eat it la kan dan tak malu je halau dia masuk umah balik so I can rush home for my dah-lame-kempunan roti kirai and kari daging.. and mak dia buh ubi jugak!! Yeay!!! Sgt suke!! Anak murid kak Ana try buat sendiri pulak hehe.. This is like entry ‘perak buih’ haha.. I wrote about the deco class on my last entry right? I was excited about the class and all that but I knew I would never find time to practice it or even to bake. That was what I thought la..
..turned out, I was a bit wrong! Hahah! Well, THAT was what I had planned la.. Had a look around, from almost all electrical shops in Parit Buntar to Billion.. then headed to Megamall (?) to see the prices there. THEN, came back to Pt Buntar to the first shop I had went to BUY it!! Ape ni Ayu, kate nak survey ja?!?! Then that night, couldn’t sleep! The usual lah.. but I’m suspecting this was due to being excited of my purchase haha.. and ketaksabaran mau mencoba! Aci? So got outta bed and did my first try. The result? Okay la, I know, sgt la amateurish kan? But aci laaa hehe.. practice makes perfect! (Ye ke?) This one byk gune idea kak Ana on what she had taught us. 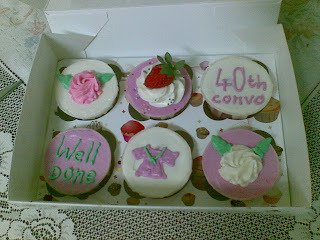 I tried doing the graduation robe tp ala² tak jadi la kan. Actually, this ‘first batch’ of mine ni dpt kat 4 people. Liza, Rashwan, Choong and Rashid. Kate Choong, dia takut nak makan hahah.. very ampeh la! And also, ade la lebih skit kan coz I did two batches actually. The first one ditambah with the pickled strawberries in my fridge and a bit of strawberry paste bought from a baking shop in Nibong Tebal. 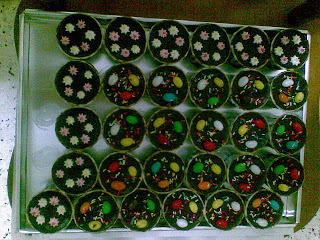 The second batch I tried kak Ana’s suggestion on choc chip cuppies so mmg ade lebey la. Didn’t know what to do with them at first but then again..
..you know ape lagi fungsi my students in my life? 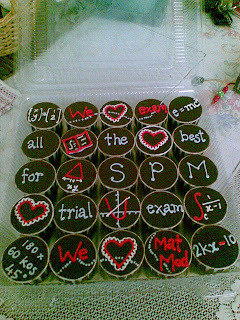 Sbg guinea pigs mencube my experiments hahah.. this time it was my form 4 class and since I also had left-over buttercream, dengan cincai² nye lah I tambah on the cupcakes. Sgt takde nilai esthetic, okay! So after this I wanna try the Oreo suggestion! Abih la bill letrik ku bulan ni.. ni kak Ana nye pasal le ni!!! Heheh.. Even after almost two months after the Sg Sedim~Sg Pinang Expedition, we still had some work to do about it. The final phase of this year's programme was the post-program questionnaires as well as the CD and certificates. Thats why this morning, me, Salleh and Arep found ourselves heading towards both schools. Actually, sgt la rindu kat bebudak ni. Even if they were a bit more cheeky than last years students..
Not much to share pun, just a bit on what made me sooo happy! Hahah..
At To' Kandu, when we wanted to go back, the students said they had something to say..
Then at SKPJ, the first thing I noticed when we saw the students was ADIB ku yg chumel! Hahaha.. he was shouting 'kak Ayuuuuuuuu' while waving with both his hands.. alahaiiiiiiiii! Of course la kat skolah ni we were 'received' differently haha.. ngan bising nye ape la.. just a bit 'control' la kot diorg since the Headmaster was with us all the time. Tu pun sempat la lagi nak gaduh with Amin, Aiman, Zaqqim, Fattah (yg senyap skit) dan lain².. and dpt la cubit pipi Adib byk kali! Rindunye la kat korg!! Heheh..
Dayah was the one who was excited about the class. It started when Sha had wanted to order some cupcakes for her engagement so she had asked me some if i knew anyone who could help her and I gave her the two usual numbers I give everyone else, kak Wan's and kak Ana's. In the end, since kak Wan couldn't deliver them, Sha had ordered from kak Ana and I guess Dayah was excited on the prospect of the classes that kak Ana dia in her free time. I grew up watching Mama doing our own birthday cakes. Kitorang mane penah beli dulu, semua Mama buat. 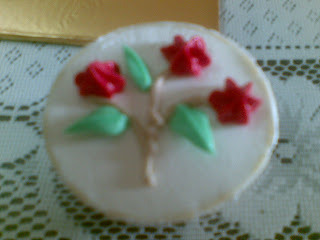 Fondent tak fondent, my siblings birthday cakes were made from royal icing and all the likes of fondent, thanx to Mama. And this was when we were smaller, especially during primary. 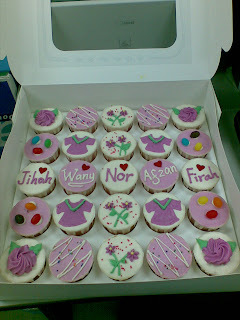 She also did the hantaran cakes for my older cousins dulu. I have a picture of my 6th birthday cake somewhere and I'll post it in this blog on of these days. I just wish Mama would still do it coz without being biased, I think she's good at it! Nape la tak turun kat anak ek hehehe.. Anyway, after a few cancellations (ade ke perkataan nih?) we finally confirmed our presence (eceh!) 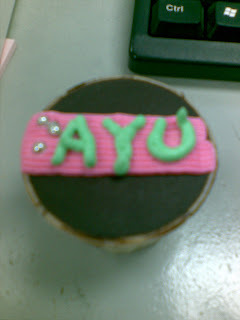 for the 7th August class.. yeay! Dayah je last minute tak dpt gi sbb balik kampung due to the cuti H1N1 hehe.. trus je dia malas nak balik sini. Kampung jauh kaaaannn.. kat Johor tu! So only me, Ija and Sha remained. 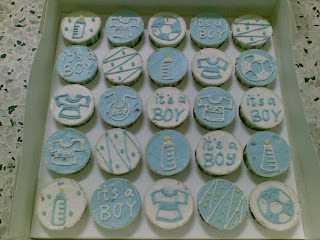 Then came the exciting part: decorating them! Heheh..
We each bought some nozzles from kak Ana. Nak carik sendiri guarantee malas kan.. I guess I could ask Mama for her old ones but what if tetibe dia semangat nak buat balik? 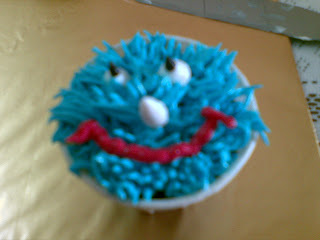 *cross finger* I'm planning to pujuk her to do Adi's wedding cake, aci? Some nozzles tu I kenal sgt la hehe.. a lifetime of watching Mama made me smile as memories started coming back to me of us perching on chairs all around Mama while she did her masterpieces but the first type od deco kak Ana taught was with one nozzle yg sy tak penah tengok Mama pakai pun. Okay, before I 'show-off' mine, sy terpkase la minte maaf ye for the quality of the pictures. Bese la, ancient phone kaaaaaann.. 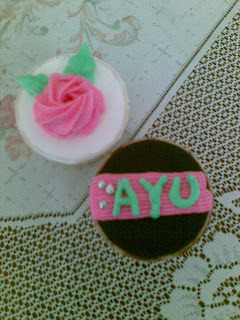 I have better pictures by Ija's phone yg tak amik lagi from her tp tak sabo dah nak masuk dlm blog ni so bear with me, k heheh..
Hehe.. chumel tak my Cookie Monster yg tak berape jadik ini heheh.. Org lain punye sumer lawa² but I think I have what kak Ana said as tangan keras! Aci? Kene practice lebey nih..
Mat tgk ni trus berkenan hahah.. takpe la, bg je kat dia wpun mulenye sy aim nak simpan yg tu untuk diri sendiri. 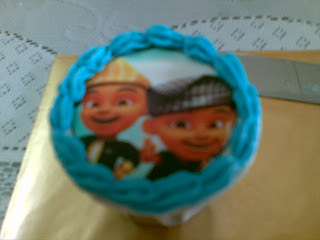 We just did the border around the edible picture for this one sbb gambonye pun dah chumel kan! 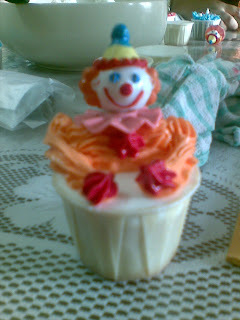 Then third one we did a clown mcm selalu nmpk kat bakeries tu kan. Nmpk mcm senang but my tangan keras menyatakan sebaliknye hehe..
And my favourite one came next. 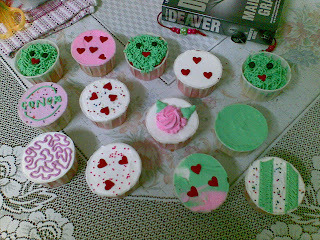 It was the easiest one la kot, I think but I like the colour and the fact that kak Ana gave us a fondant red heart each. Cantik kan! The colour mcm sgt la sweet and rase syg nak makan (not that I like buttercream that much pun, mesti buang punye haha.. but for deco, cantik laaa!) Sbb tu kot yg ni sy bg kat Shahril plak since nmpk je dia berkenan yg tu. And besides, I know he appreciates bende² camni since dia pun suke ke dapur gak. The next one kak Ana taught us this nozzle panjang ni. You can do daisies or ribbons with it tp sy punye mmg tak jadik langsung. Serius! Mcm malu je tgk yg tu and had already chup that for myself tanak kasik org but suprises of suprises, Mat nak yg tu hahahah.. jenuh la ckp kat dia yg tu la yg sy paling malu of the outcome. Sbb tu kot I didn't take a picture of it heheh.. cepat je sy simpan dlm kotak lepas siap sbb rase segan tgk sy buat tak jadi! Then the last one kak Ana tunjuk how to do small stars/flowers..
Pastu the last two designs we used choc ganache as the base. 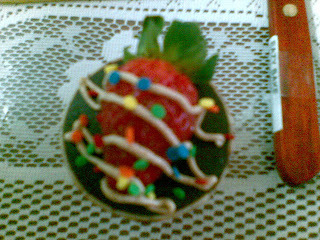 The first one was a trip down memory lane for me because it was the choc strawberry cupcake.. suke!!! Jadi tak sy buat? Hehehe.. tah pa pe Ayu ni heheheh.. beze skit la from the one I got sbb choc dah tak cukup tp sy rase cam chumel jek jugak. Bes kan? We really had fun wpun tangan sy sgt la keras.. camne la nak bg lembut ye? 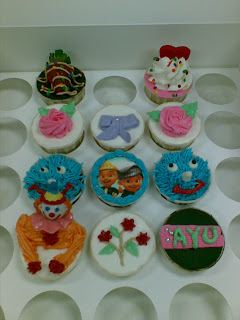 And we're already planning on taking her fondant class.. aci? THIS is why I hate the so-called real teachers! This week, I've had a good week with some of them. My form 2 class in Jawi came in form of a great suprise by a positive change in one boy while in my form 4 class, also in Jawi, I had a good laugh when Nazleen, my student, complained that for each and every new topic, I always say, "This is the easiest topic in your form 4 syllabus". Konpius bebudak tu, mane satu yg paling senang sbnrnye hehe.. So today was actually a big change from that! Usually on Saturday nights, it would only be my class and Cikgu Rohaizat's class in Bagan Serai. We had the whole tuition centre to ourselves and we rather liked it that way. But these pass few weeks have made us a bit uncomfy when a lot of teachers have been doing extra classes for the UPSR students. Still, its their tuition centre too, right! I noticed when I arrived that Teacher Harjit was giving out an extra class tonight and didn't mind it much since Teacher Harjit is one of those teachers that students and other teachers like. Then I noticed the class beside mine was also occupied and I just assumed it was Cikgu Shukor.. Classes start at 8.15pm during weekend but behold, at around 8.30pm, the biggest ego on earth came sauntering through my class towards the next room. My osmanphobic senses were giving out alarming sirens and my oversensitive nose smelled trouble brewing. Okay, maybe I'm exagerrating.. a tiny bit.. or maybe not! Not even three minute later, I saw him rushing outta his class and once again, I felt my heart drop down to my knees.. ape plak lagi ni? Then suddenly Ina came into my class, scolding the boys in my class saying, "Korg ni bising sgt. tau tak budak² kelas sebelah tu tension smpi tak boleh nak belajaq?" I was like, "What the..?" First and formost: Tension smpi tak bleh blajaq?!? Apa psycho and emotionally disturbed ka budak² tu? Secondly: MY CLASS TAK BISING PUN!! Maybe ade mase diorg bising, I know.. but tadi they were actually LISTENING TO ME TEACH IN FRONT! I knew it! I just knew it!! HE always brings trouble along with him whenever he see's me! And sblm ni sy selalu maintain good relationship with the staff, but for the first time ever, I raised my voice, defending my students, telling Ina, "Diorg tak bising langsung!!" Ina was suprised hahah.. it was evident in the look on her face that she couldn't believe I was that firm. She repeated herself, this time to myself, telling me that the AH had complained that my class was sooooooooo noisy that his students trus tension tak bley belajaq so dia request nak tukar kelas! And once again, what the hell! Dia baru masuk 3 MINIT (dah la mai lambat.. cikgu bangang!) and berani complain MY class bising when HIS STUDENTS dok lari² kuaq masuk my class! So once again, I said to Ina, raising my voice a bit higher, "Kelas ni TAK BISING langsung!" "Sound trouble apa AH tu.. telinge terlebey sensitip! ", kate sy dlm hati. Dasar AH! Then suddenly he was beside me and came in my class up to Rashdev (who was asking me a question.. and who btw is teacher Harjit's son) and pointed in his face, causing the boy to be confused on why asking me how to find the radius from a given arc was wrong? The the big ego yang sepadan with his fat a** went stamping into his own class, calling to his students to go change to the upstairs class. When Ina stammered to him that I had denied my class was noisy, he didn't even look at my fuming face and just said,"Kelas ni bukan sy tak kenai. Kuang ajaq.. semua kuang ajaq! Tu kuang ajaq, ni kuang ajaq (while pointing to my students)! Sy tak tahan la, habis budak sy nanti klau duk dekat ngan depa ni"
And he ignored me when I defended my class as if I was this piece of worthless s***! I was so mad, I kept looking at him, daring him to say THAT in MY face but he just ignored me! Pengecut ka apa, I dunno.. but for whatever its worths, he's an AH! I was still berasap when I resumed my class. It was only then when I realized the hurt look on my students' faces and my heart broke seeing them like that. Never once did they answer back as he accused them on being rude brats. For once, even Izzat, the noisiest but cleverest boy, was quiet.. and I really didn't know what to say. I was as suprised as they were on AH's rudeness! When I finally found my voice, I could only manage saying weakly while looking at them, "Korg tak bising pun.."
The Izzat piped up, "Cikgu, kami tak bising pun.. kenapa dia kata kami kuang ajaq.. kami tak buat apa pun?" I didn't know what to say. It was the first time I saw my 'overactive' student look so broken. How could I tell them, its not them. He hates me. ME! But he always does this to my students.. and never fails to break them each and every single time. Thats why I call him my diesease. Osmanphobia! I just don't understand, why does he hate me so much? What the hell did I do that he just decided to make me his sworn enemy outta the blue? For God's sake, sakit otakkah anda?!?!! I know I'm not the only one who avoids him but I'm the only one he bullies this way.. by hurting my students! This is not the first time.. and I doubt it'd be the last time. I've managed to avoid him for nearly two years now, after the last incident when he barged into my class slapping two Indian boys who DID NOTHING! A few weeks before, he had pinched an Indian girl until she cried and she had complained to my 'boss'. It was then that my 'boss' knew, I HATED that teacher and that he was always picking on my students so after that, my classes were always scheduled so that it didn't coincide with AH's classes. But I still don't understand, WHY? Why pick on MY students? Why does he hate me so much? Why take the trouble telling everyone what a lousy teacher I am, trying to humiliate me or something, when I know for a fact, he's not such a great teacher either. Apparantly, students seldom pick his class and one day he had accused the staff of backstabbing him until student hated him. Duh! And guess what, I dunno what kind of black magic he used but after that, our 'boss' told the staff to tell new students that other classes were full and they had to take AH's class no matter what! What the hell! Nampak sgt la budak² tak mau kat dia and still nak pakse gak diorg amik kelas dia?!?! Tak paham betoi laaa.. Tak sedaq² plak tu..
Paling kesian when his son (who took my class) was so red faced when he saw his father slapping those students and humiliating me. The boy usually sat in front of me and was always cheerful but after that, he sat at the far end of the class and avoided looking directly at me. He even resorted to asking his friends anything he didn't understand instead of his usual self of jumping up and down wanting my attention..
And you wanna know the reason he pinched that girl while shaking her head? Because that girl saw him coming and stepped aside to let him pass. Ya Allah, that girl was just trying to be polite and he suddenly snapped saying, "Kamu mengata saya!!!" Looo.. hang terasa pasaipa (Ye Baizurah, I KNOW how to use 'hang' effectively :p) Besaq sgt ka hang tu yang nak terasa sgt?!?! Giler bodoh ah dia tu.. stupid idiot! "Gatai! Gedik! Gaghik tatau nak cakap..!" Mase ni I was suprised with the sudden outburst.. budak² tu tak kacau dia pun and they weren't even noisy! Then..
"Besaq nanti tengok la.. jadi j*la*g!" One girl burst into tears while I went dumb with shock! When I overcame my shock, I went to console the girl and she kept asking me, "Ape salah sy, kak Ayu?" while trying to dry her tears. Seriously, ape masalah dia, I pun tatau. Nape he hates me so much, I jugak tatau. And why does he pick on my students pun is totally out of my brain punye analyzing capacity! But I'm soooo mad! Ntah ape dia fikir bile dia buat camtu kan? Understand now why I HATE HIM? Gosh! 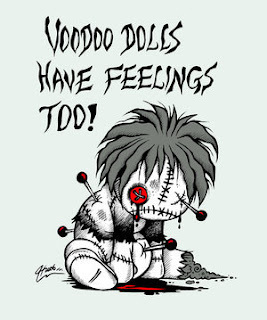 Sib baik la voodoo dolls tu syirik! Klau tak.. I'd make a good one of him and stick pins all over his body. Hmm, too normal! What else huh? I'd roast him over a bonfire AFTER I've rendam him in blended cili padi. Then, I'd shove a thick lidi up his a**.. no! Make that three! Sule cukup² biar sampai ujung tu kuar kot mulut dia ke.. Better stop now before I cross the line, huh! Just for the record. Ina, seeing how defensive I was when she knew I myself sometimes get exasperated by my class, asked teacher Harjit and cikgu Rohaizat if it was true that my class was nosiy and both of them denied it. Hah! See! Told you AH is a jerk! Okay².. as if the update is much awaited la kan hehe.. tp diri sendiri bukak blog mcm tak bes je takde entry baru. So pk punye pk, ape la nak masuk dlm blog nih? Ahad aritu did some spring cleaning of the fridge (Yup, my blog is not the only thing I own that needs some airing hahah..). Found a-week-old cut of salmon I bought at half price in Jusco (dah half price to confirm la yg semalam dia potong kan so actually should've done something with it sooner) and a week old green pepper (or capsicum if you must). Tatau nak wat ape but then thought of the old boring thing to do.. TOMYAM! Hehe.. 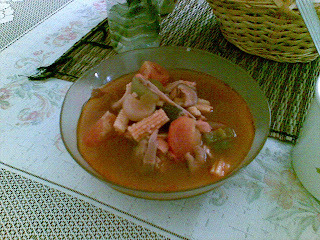 So headed off to the market (Funny how I can NOT sleep after Subuh whenever my heart sets itself for a trip to the market hehe..) to but some baby corn and tomatoes and mushroom and the result.. tadaaaa.. Sorry thing is, sampai malam ni (its Tuesday) still tak abis lagi hahah..
Then when Arep came to take the dish, I was awarded with a suprise yg sgt cute hehe..
Chumel kan? 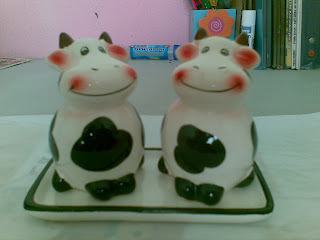 Lembu salt and pepper shakers.. that I WON'T use la kannnn..